A scientific review panel has recommended a dual spilling and barging strategy to help juvenile salmon and steelhead in their migration around Snake River dams in May, saying a federal agency's proposal isn't supported by science. NOAA Fisheries Service, citing low water flows on the Snake, has proposed stopping the spilling of water over three Snake River dams during the critical May migration period. Instead, the endangered spring/summer chinook and steelhead would be collected and barged to below Bonneville Dam on the Columbia River. But a report released Friday by the Independent Scientific Advisory Board -- formed by NOAA Fisheries and the Northwest Power and Conservation Council to provide independent scientific advice and recommendations on issues relating to fish and wildlife programs -- said that a "mixed strategy" of letting fish migrate naturally through spills over the dams and barging them was preferred. 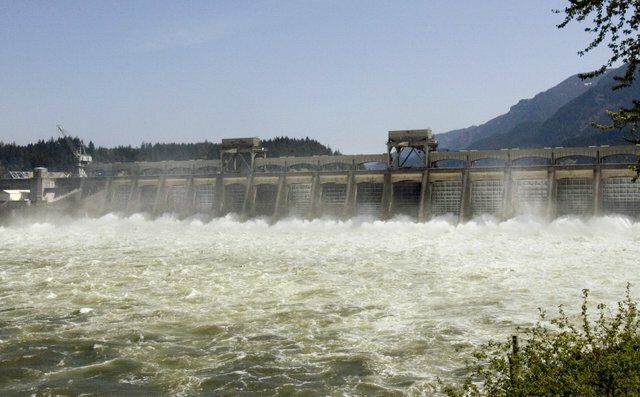 The board's opinion is nonbinding on NOAA Fisheries and the Army Corps of Engineers, which is responsible for the dams on the Snake and Columbia rivers. Managers from the Corps, NOAA, Bonneville Power Administration and Bureau of Reclamation are to meet this week and discuss the report, said Rock Peters, fish program manager for the Corps' Northwest region. Officials from the federal agencies also will meet later with representatives of Native American tribes and the states. "We got their report and we are taking it under advisement," Peters said of the board's finding. Peters said it isn't known when a final decision will be made, but it will have to be before May 1. Brian Gorman, a spokesman for NOAA Fisheries, said while the panel's decision isn't binding, "it certainly has a fair amount of influence." NOAA Fisheries Service filed its barging proposal with U.S. District Court in Portland, where Judge James Redden is overseeing operations of the dams while deciding a lawsuit involving the salmon recovery issue. Wild steelhead and spring, summer and fall chinook are listed under the Endangered Species Act in the Snake River system. Biologists with NOAA Fisheries based their barging recommendation on scientific studies of fish runs over a period of years, including a similar low-water year in 2007. That year, fish were barged downstream and also allowed to migrate naturally through water spilling over the dams. The NOAA studies found juvenile salmon and steelhead that were transported in 2007 have returned upstream at higher levels as adults than those that made their way downstream through spilling. They believe that's partly because the fish that traveled on their own were more susceptible to predators and warm water and arrived in the estuary when food was not as plentiful. Barging is one method for ensuring fish survival under the salmon recovery document mandated by the Endangered Species Act -- the 2008-18 Federal Columbia River Power System Biological Opinion. Water flow on the Snake for the April to July time frame is forecast to be 56 percent of average, according to NOAA hydrological data. During low water periods, juvenile fish are susceptible to predators and higher water temperatures. But the Independent Scientific Advisory Board said the effects of barging on Snake River sockeye salmon -- also listed under the Endangered Species Act -- aren't known, and studies that examined spilling and transport that were started last year and expected to continue this year could provide answers. The board also wrote that there was "a gap in knowledge" of the effects of spill-barging on downstream juvenile Pacific lamprey migration. And some steelhead stocks barged from the Snake showed a higher straying and lower homing rate than fish migrating in-river, according to the board. "From a scientific standpoint, a mixed strategy for spill and transport is best supported by the available science," the board concluded. Opponents of the barging-only proposal said they were not surprised the board supported a dual strategy for aiding fish migration. "We certainly hope they (federal managers) will listen to what the ISAB said and will not try to terminate spill at these dams," said Earthjustice attorney Todd True, the lead lawyer for plaintiffs in the lawsuit being decided by Redden. Liz Hamilton, executive director of the Northwest Sportfishing Industry Association, said stopping spills and barging fish in May would leave juvenile fish left in-river even more vulnerable to predation or mortality from passage through turbines at the dams. "Those of us who know fish know when you have spills you have fish in the water," she said. "It'd be a dream come true for NOAA Fisheries to do this (spill and barge) without being ordered to do it by the court," she added. But Northwest RiverPartners, an alliance of ports, some utilities and agricultural and business interests, said in a statement that the NOAA data made it clear that "spilling young fish at the three Snake River dams will result in higher mortality for steelhead and chinook this year as these fish will face higher temperatures and increased predation by birds and sea lions." The group said it urged federal managers to "implement the law and not undertake grand experiments at the expense of listed salmon and steelhead."